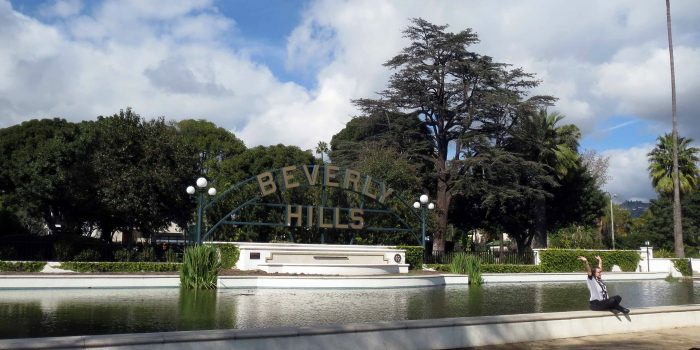 The 40-foot long Beverly Hills sign, located in the Beverly Gardens Park, is one of the most photographed spots in the city. The sign, today, is a replica of the 1907 sign and is surround by a lily pond. The park stretches for 22 blocks along Santa Monica Boulevard. It has a jogging path, hundred-year-old cypress and fucus trees, gardens, and public art. Beverly Hills is a 5.7 square mile city with 34,000 residents and a daytime population of more than 200,000. The clock below the famous Haight Ashbury sign in San Francisco is permanently set to 4:20. According to Steven Hager, editor of High Times, the term 420 originated at San Rafael High School, in 1971, among a group of about a dozen pot-smoking wiseacres who called themselves the Waldos, who are now pushing 60. The term was shorthand for the time of day the group would meet, at the campus statue of Louis Pasteur, to smoke pot. Intent on developing their own discreet language, they made 420 code for a time to get high, and its use spread among members of an entire generation. This morning we left Sturgis, South Dakota heading to Cody, Wyoming we saw many thing along the way. Â There was road constructionâ€¦â€¦.Â a skeleton seat coverâ€¦a terrible lunch @ Country KitchenÂ Â Â Â Â Â Â Â Â Â Â Â Â Â road signs telling you to return to the city you just left when flashing meaning that â€¦â€¦Â Â Â Â â€¦.the snow fences didnâ€™t work.The Madonna sitting out in a field with absolutely nothing around andâ€¦â€¦.the full moon when we left Adriano’s Italian Restaurant. A perfect ending for a perfect day.